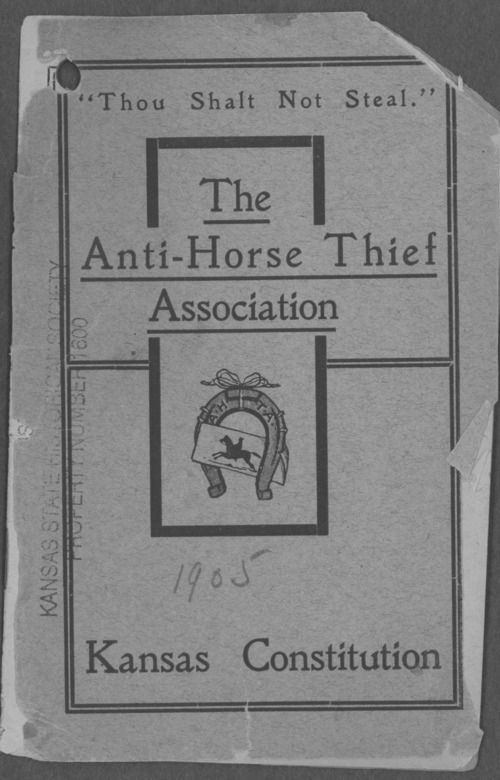 This is the constitution and bylaws of the Kansas Division of the Anti-Horse Thief Association. Officers include N. J. Randall, L. P. Ferguson, G. J. McCarty, J. C. Moore, B. B. Fitzsimmons, and T. H. Sparks. The group was first organized to suppress plundering during the Civil War, and continued to "aid in the upholding of civil laws, to insure the safety of our people, and the security of our property against loss by thieves, robbers, murderers, vagrants, tramps, incendiaries and all violators of the law."